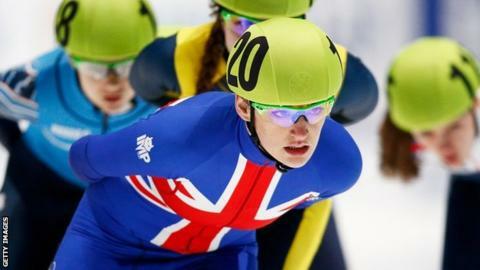 Great Britain's Charlotte Gilmartin won 1500m bronze at the short track speed skating World Cup in Shanghai. The Redditch skater, 25, secured her first medal on the World Cup circuit in her debut World Cup A final appearance. Fellow Briton Elise Christie, 25, won the B final on Saturday morning to finish fifth overall in the 1000m. Gilmartin competes again in the 1500m on Sunday, while Christie is seeking a fourth World Cup medal of the season in the 500m at the Oriental Sports Centre. The Scot followed up her gold and silver medals in Toronto with a silver in the 500m at the third ISU World Cup event in Nagoya, Japan last weekend. In the men's competition, Murray Cochrane is through to Sunday's 1500m quarter-final after recording a time of two minutes 13.278 seconds in Friday's heats. The Dundee-born skater, 22, beat the previous British record of 2:14.091 achieved by Jack Whelbourne in the first round at the 2014 Sochi Olympics en route to becoming the first Briton to reach an Olympic 1500m short track final.